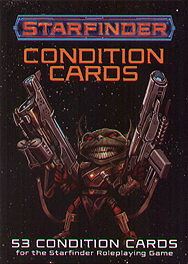 Be prepared for nearly every outcome with Starfinder Condition Cards, a handy way for players and GMs to keep track of the most common conditions in the Starfinder Roleplaying Game. Has your soldier been paralysed by an alien's toxic venom? Has your operative used a cloaking field to turn invisible? Is your entire starship crew off-kilter in zero gravity? Just hand out the appropriate cards and keep all the rules for each condition at your fingertips! This set of 53 comically illustrated, full-colour cards will speed up gameplay at any table!